It’s been a busier week than usual and I’m not up for doing anything complicated in the kitchen. Twice this week I relied on the magic of the Bumble and Bumble Dry Shampoo since I couldn’t find the time to do the necessary hair washing (TMI?). In my zeal to de-grease my hair though I got a little too aggressive and ended up looking like a member of the Whig party. I’m taking it easy tonight, and I’m not even taking pictures — the picture above was taken when I was in England this summer, and made this dish for a large dinner party. The one below was taken later this summer when we had some friends over for an impromptu dinner. So the point is, I make this dish a lot, because it’s easy, tastes amazing, and looks pretty if you don’t take a picture in bad lighting with a purple lighter in the backdrop like I did. This tastes a thousand times better than my picture makes it look. I first had it at my friend Patricia’s house. We all greedily mopped up the drippings with bread, and I kept trying to think of ways to get everyone else out of the room (“Fire!! !”) so that I could drink the sauce. I begged her for the recipe and couldn’t believe how easy it was — the ROI on this is very high indeed. In fact, I’m thinking I may save the sauce next time to start my own master sauce. Anthony Myint, one of my food heros and a fellow high school alum, in his book Mission Street Food: Recipes and Ideas from an Improbable Restaurant (you HAVE to read this book — it’s hilarious, inspiring and will change your life) writes that a master sauce is “…a fortified stock achieved by reusing the same sauce over and over. Some Western cooks find this gross, but to me, wasting perfectly good meaty broth is gross. The concentrated braising liquid results in a richer flavor, so if you’ve got it, flaunt it.” Well said, Anthony. So this is how easy the recipe is: make a vinaigrette, essentially — olive oil, balsamic vinegar, dijon mustard and garlic; add in some rosemary and brown sugar, salt and pepper, and mix it all up. Place the chicken in the vinaigrette and let it marinate over night. Stick it in the oven to bake, and be sure to serve with big crunchy slabs of bread to dip in the sauce. 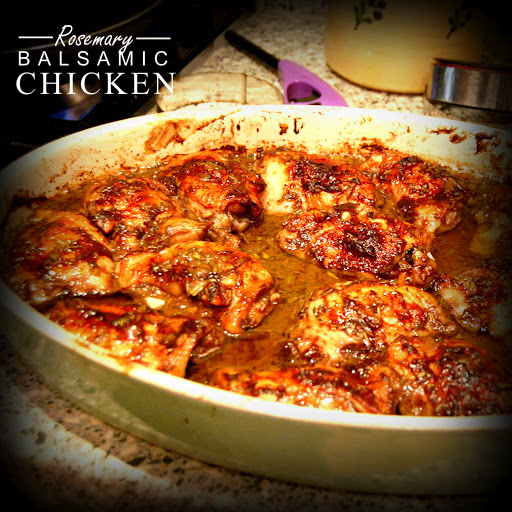 Combine marinade ingredients and mix together in a 9×13 baking dish. Place chicken pieces in marinade for 4-24 hours (with 24 hours preferred). Ensure chicken is coated well w/ marinade. Place dish in oven at 400 degrees, 35-45 minutes, depending on your oven (watch the skin as it burn easily from the brown sugar). The marinade should create a nice, yummy sauce for bread dipping. Summer is drawing to a close and I still have a backlog of fruit crisps, black russian kales and catfish delights to post about. Even though I’ve been out of school for a very long time, I can always feel this time of year a certain note of melancholy in the air, the sun making its rays more solemn, the crispness in the rustling of leaves, a purposeful, bittersweet sign that one era is dying down as the next one emerges. All that as a fancy way of saying that I’m really glad figs are in season. O how I love thee, fig! This is my favorite way to have figs — straight up and whole. No recipe required. But this post isn’t really about figs. It’s about spaghetti and meatballs. Which somehow seems appropriately school-year staple, because of that On Top of Spaghetti song. When the girls and I were up north, my brother and my sister-in-law welcomed us with this tasty Barefoot Contessa rendition of the spaghetti and meatball classic. Here are my brother, sister-in-law and the girls wishing I would stop taking pictures so that they can eat. My sister-in-law is about to go into labor any day now, and today is Labor Day so it seems like it should happen today. I haven’t heard anything yet though. These meatballs are special. They’re made with turkey, sausage, prosciutto and Asagio cheese, and Ina Garten says that they’re the best meatballs she’s ever had! I think Ina knows a thing or two about meatballs. Because you never know when might need an owl hat. ‘Twas an idyllic late summer getaway…thanks for hosting us, M&A! Preheat the oven to 400 degrees. Line 2 sheet pans with parchment paper. Place the bread in the bowl of a food processor fitted with the steel blade. Process until the bread is in medium crumbs. Transfer the crumbs to a small bowl and add the milk. Set aside for 5 minutes. in a large mixing bowl, combine the turkey, sausage, prosciutto, bread mixture, Asiago, parsley, oregano, red pepper blakes, 1 tsp salt and 1 1/2 tsp pepper. Lightly combine the ingredients with your hands. Add the 3 TBSP olive oil and the eggs and stir lightly with a fork to continue. With your hands, lightly roll the mixture into 2-inch round meatballs and place them on the prepared sheet pans. Brush the meatballs with olive oil. Bake for 35-40 minutes, until the tops are browned and the centers are completely cooked. Pour the marinara sauce in a large, low pot, add the meatballs and bring to a simmer. Meanwhile, cook the spaghetti in a large pot of boiling salted water according to the directions on the package. Drain and place the spaghetti in individual bowls, and top with 3 meatballs and lots of sauce. Serve with Parmesan cheese on the side. At the oast house lives a dog, Musty. My kids beg me 382.7 times a day on average for a dog, and when we’re over they make it their personal mission to be Musty’s personal trainer, working with him for 90% of the day. They start with a morning run through the fields, during which Musty is required to fetch sticks through wheat, streams and over equestrian-type obstacles. Here, my father-in-law Chris observes a never-ending game of fetch, shortly before Musty begged for mercy. I write about Musty to offer these quality personal training services to your dogs. I’m not ready to commit to a pet, so it would be a great help if there are canine volunteers out there looking for some endurance training. One thing you see a lot of in English gardens is roses. And these flowers, whose name I forget, so I’m just going to call them St. Agnes Himmyhocks, because it just feels right. My mother-in-law, Georgina, who is as famous as I am usually famished, had an idea that we should make rose petal jam with the roses in the garden. So she and the girls went around the garden and gathered petals. Start by prepping a syrup of sugar, water and lemon juice and let it boil down until syrupy. Throw in the rose petals — we had mostly pink but some blue (violet) roses which added some nice color — and let them boil 20 minutes. Once we were done boiling we found that the petals were still rubbery, so Georgie ended up fishing them out of the jam. I know, that’s not really the right picture for what I just said, but I didn’t get a picture of that. The result? A brilliant violet-colored jam that tastes like it smells — a wonderful combination of the sweetness of roses and the brightness of lemon. Up top you can see that I had it drizzled over vanilla ice cream with raspberries on top…divine! There are a number of different recipes online for rose petal jam, some of which involve soaking the petals in advance, or coating them with sugar overnight — they may result in softer petals and perhaps you would be able to leave them in. We haven’t yet experimented with those. But this one was lovely all the same. See how happy Georgina is with the jam? Combine water, sugar and lemon juice and bring to a boil. Lower heat and simmer for 5 minutes. Add in pectin and simmer for 2-3 minutes longer. Add in rose petals and cook for 20 minutes, stirring occasionally. Jam will begin to take on the color of the petals. With a slotted spoon, fish out petals, pour jam into jars allowing room for expansion, and cover with jar lid. Allow to cool and use or freeze (tip: if you freeze, use only jam jars with straight sides to avoid glass breakage from jam expansion). Makes 2 1/2 – 3 jars. Anyone else experiment with rose jam? Would love to hear your suggestions! Recently, I read Gary Taube’s piece on obesity in Newsweek (for a consolidated summary of the article, read Laura Pappas’ post here). It’s good; you should read it. It reminded of what I already knew: refined sugars, bad; meat and leafy green vegetables, good. But after having spent the last week eating jam, I needed a reminder. I’m not very draconian about avoiding refined sugars, partly because I try to practice moderation, but mostly because I like how it tastes. And you’ll never be able to save a bowl of french fries with parmesan and truffle oil from my rabid consumption. Still, I’m at the mortifying age where friends on Facebook starting to talk about things like cholesterol and blood pressure, so it’s probably time to up the diligence a bit on that end. But there’s good news: there is such thing as healthy and delicious! Because I won’t compromise on delicious. So here’s an easy recipe I put together with things that came in our CSA delivery: chicken with fennel and grapes. Salty and crispy with a tangy sweet kick — yum. So, grab some chicken — here I used bone-in thighs, since I like the size and how they stay tender and juicy. I was cooking for a crowd, so you might use less chicken. Because eating this much by yourself would probably land you in OB City. Season both sides generously with salt and paprika — take a look at the picture above for a sense of how the paprika should be distributed. Lay them in a baking dish, skin side up, maximizing the surface area that’s exposed on top. Slice up some fennel bulbs into thin pieces (save the fronds for another use; I put them atop salads or in my Eggs Benedict California), and nestle it under the chicken. Pull off a handful of grapes, and nestle under the chicken, placing a few on top. You can see in the picture below a better view of how I sliced the fennel. I had some excess fennel and grapes so I put them on top of the chicken. Stick it in the oven, bake, baste to make the skin crispy, and serve! I served it with plain quinoa and some simple broccoli. Preheat oven to 375 degrees. Pat the chicken dry with a paper towel, and season with salt and paprika on both sides. Put into a baking dish skin side up. Slice the fennel bulb into 1/4 inch slices, saving the fronds for a future use. Separate grapes from stems and nestle bulbs and grapes under and around chicken. Bake in oven for 20 minutes. Baste chicken skins with juices and bake for another 10 minutes. Remove from oven and serve. Yup, jam, like straight. off. the. spoon. The way I ended up with this jam is that my friend Leesa and I spent a morning hiking the canyon in our neighborhood a while back, and she started talking about the jam that her grandmother used to make. Strawberries are going strong right now in our area, so we decided afterwards to head to the store to get a bunch. If this were a reality show I’m sure the ratings would be really high on this episode where we talked about the grocery store strawberry sales. So we bought strawberries and made this jam. Did I mention Leesa, raised Mormon, is my personal tutor on Mormon swearing? Frickin’ frickster! Motherfather this is good jam! And so easy. Cut up berries til you get 4 cups worth. I used a 50/50 mix of strawberries and raspberries. Toss them with pectin and sugar. I know, my pictures are always blurry after I type “sugar”. Boil for a minute and then put into a glass jam jar. My family went through three jars in about as many days. This works really well if you have tart berries too — I like my jam a little tangy, which is why I mixed in raspberries. It is fabulous as jam. As a topping on ice cream. As a topping on strawberries (I really did that). And of course, all by itself (nutritional value not provided). Put berries in a large, heavy pot and mix with sugar and pectin. Bring the mixture to a boil over medium-high heat, stirring constantly. Let berries cook at a boil for about a minute, and then ladle into jars, leaving an inch of headroom for expansion if freezing. Cap, cool to room temperature and eat it like there is no tomorrow.